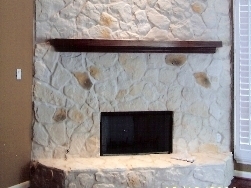 Looking for a Mantle that can be built to any height or length and custom stained? We can help and even install it for you. 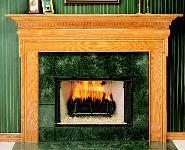 You have the choice of Wood or a Stone Mantle Surround, Mantle Shelves in Stain or Paint Grade Woods. Stain Grade Woods available are Oak, Maple, Cherry, Mahogany or Walnut. 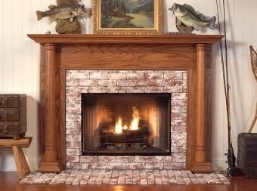 Did you know we also do Fireplace Remodeling. The photo to left had a Texas Cream Field Stone applied to the entire fireplace wall with a Custom Stained Hudson Mantel Shelf. This is just the beginning of mantles that are available at Chim-Chimneys. 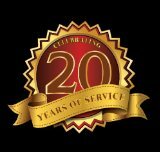 Come by our store or call 281-316-9077 and talk to one of our Staff Personnel for the Mantle or Fireplace Remodel that's right you! Mantles make their own statement! Pictured here is the "Georgetown" in a stain grade finish. 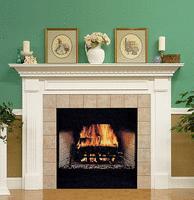 Mantle surrounds come in standard sizes but we can supply custom sizes to fit any fireplace. The "Harrisburg" adds subtle elegance with its Dental Molding and Fluted legs. Shown here in "paint grade", it is also available in a stain grade oak. Mantle shelves offer a unique way to decorate a smaller space. All mantle shelves are available in a paint grade or stain grade wood. Made to fit any size.